Do I need previous whitewater experience? One of the great things about the Ocoee River is that there is no experience necessary! There will be a trained guide in each raft, and we think we have some great guides. After the trip you will too. Is there an age limit to raft on the Ocoee River? Yes. The Tennessee State Parks Department requires that to raft on the Ocoee River you must be at least 12 years of age. 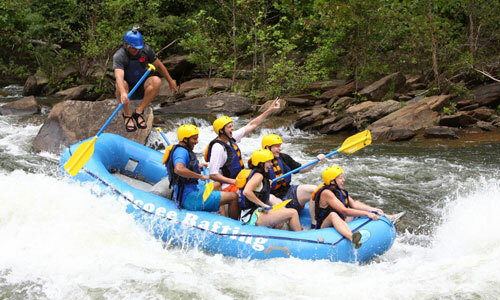 Full Ocoee River: If you want a real fun-filled, action-packed day we offer the Full River Trip. We start with a trip down the Upper Ocoee River and then we take you on a trip down the Middle Ocoee River. With around 10 miles of whitewater rafting, the Full River Trip takes about 3 - 3 ½ hours on the river. From check-in to check-out, expect this trip to take you around 5 hours. How long is the bus ride to the Ocoee River put-in? The Ocoee Rafting outpost is only about 5 miles to the river, which is an advantage for us because our customers only have to ride the bus a short distance to the river and back. We are on the upper end of the river rather than the far lower end, that’s why we have a shorter bus ride. We are only about 2 miles from where the Cherokee National Forest begins and from there it is only mountains and river for about 20 miles. The bus ride is just a short part of your overall trip. You are going to get wet anyway so you’ll never know the difference! In the outdoor adventure business it would be hard to do business according to the weather, so we do run our trips RAIN OR SHINE. 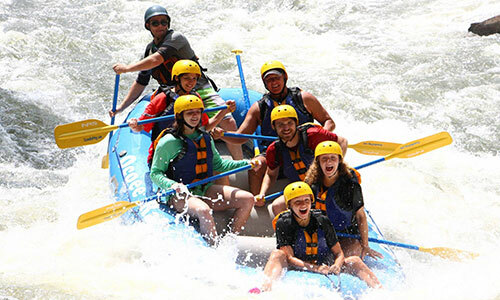 Whitewater rafting is one of those sports where you are going to be wet from about the time you get on the river until the time you get off, but you’ll be having so much fun you probably won’t even notice. We do have splash jacket rentals available during the Spring and Fall months on cool, rainy days. Anytime the river runs will be fun, but there are better times than others. The best time to go rafting is through the week in June, July and August or on weekends in the Spring and Fall. Saturdays of course are sometimes more convenient for many but Saturdays in July and August are the busiest days of the season and most of these days it is very crowded on the river. Being crowded does not mean you won’t have a good trip, it just means you will probably have a longer wait to put on the river and the guides may not get to play on the rapids as much due to heavy traffic of other rafts. If possible to raft on other days rather than the busiest days of the season, it is best, but any day you raft we will do our best to make sure you have a great whitewater rafting experience. Yes! We have found that photos are an important part of most everyone’s whitewater rafting adventure. You’ll have so much fun we’re sure you will want to capture a memory of it. Photos are taken of each raft on each trip and are available for you to view when you get back to the outpost after your trip. Our check-in time is the trip time. There is no need to be at our outpost until your trip time. We check in for 20 to 30 minutes depending on how large the trip is. If you arrive at the trip time, you will still have enough time to check-in and then get to the restrooms and changing room before the trip begins getting equipment and a safety briefing. It usually takes another 20 to 30 minutes to get equipment and get a safety briefing. Total time before the bus takes off is usually about 45 minutes from your trip time. It is not recommended that you arrive any earlier than your scheduled trip time in order to prevent long waiting periods. How will we be seated in rafts? We have 6 man rafts and we fill our rafts as needed. We do not guarantee that you be seated together unless you make a reservation together under one name and pay with one credit card. If your reservation is for more than 6 people, we fill one raft and the rest will go in another raft. We will not break up a group of 6 people if they have booked together under one name. Do you recommend any other outdoor activities? 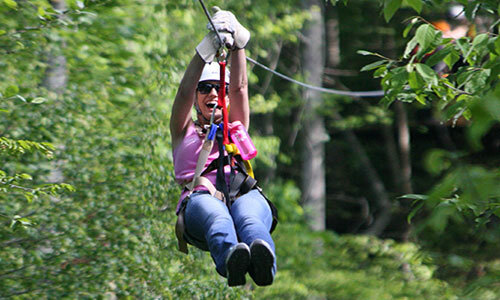 Zipline Canopy Tours of Blue Ridge: Offering an amazing 40 and 75 foot tower, 3 sky bridges, and over 6,000 feet of cable, this course allows participants to zip for over one mile through the beautiful Blue Ridge Mountains. You'll experience the mountains from the treetops, you'll zip into the valley, soar over pastures, and cross over Fighting Town Creek. No experience is necessary. Our experienced guides will lead you on your journey through the trees. All participants must be between the weight of 70 to 250 pounds. Ask us about our Raft & Zip Discounts. 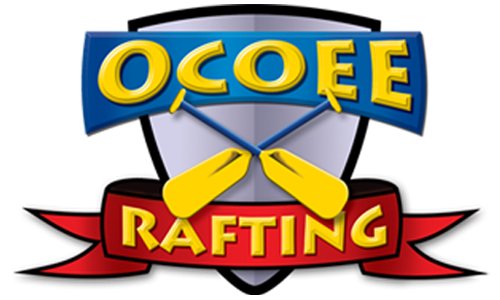 Toccoa River Tubing Company: Offers tubing, canoeing, and paddle boarding on the beautiful Toccoa River. 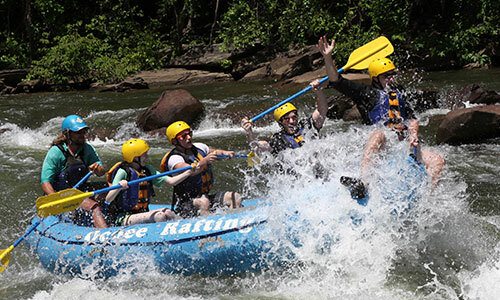 Only 3 miles from Ocoee Rafting, this is a fun and inexpensive addition to whitewater rafting. Also great for groups with children too young to raft, because the Toccoa River is good for everyone 3 years or older. 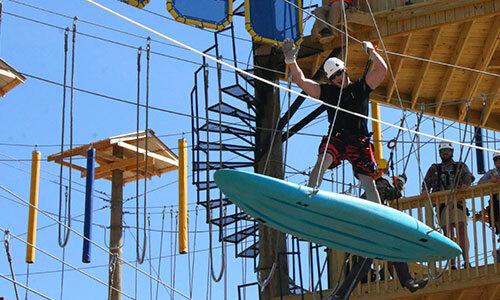 Blue Ridge Adventure Park: This aerial challenge course features suspended bridges, tight ropes, climbing walls, ziplines, and other fun obstacles for every age and ability. The courses are designed to be self guided, and you can go at your own pace. Three different levels of courses are offered for ages seven and older, with each level becoming progressively more difficult. We also offer a ground level course for children ages five and six that can reach at least 65 inches. Each participant will be clipped in to a safety line while on the course. This is the perfect family adventure in the beautiful North Georgia Mountains.